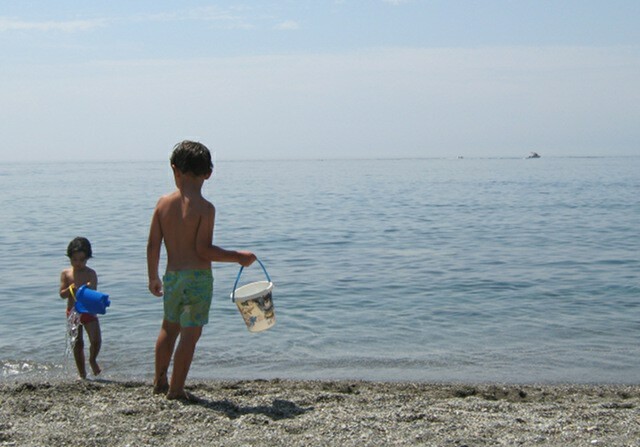 But just occasionally so much joy can turn sour – transform them into mini savages. You only need to turn to Lord of the Flies to know how tenuous our so-called civility can be. If you write something prompted by this, please let me know by sending an email to Judy(at)socket creative.com. With your permission, I’d love to publish it on SkyLightRain.com. 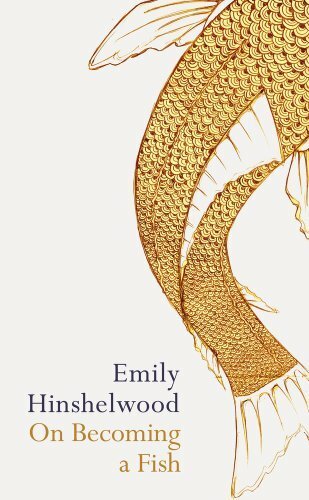 In this collection of finely drawn poems, Emily Hinshelwood invites us to accompany her on a series of meandering strolls through the coastal landscapes of west Wales, and presents a series of impressions it may take eons to erode. What a wonderful idea! 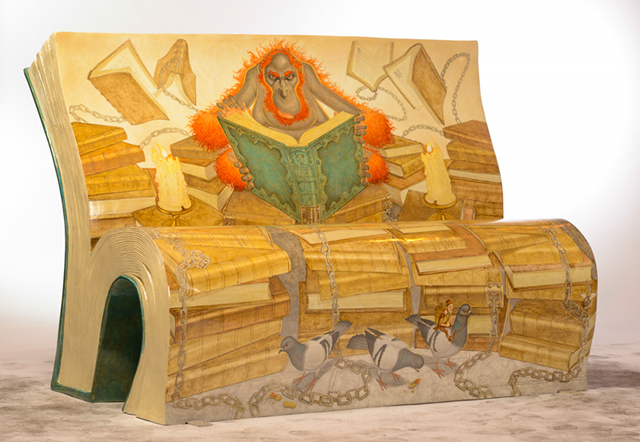 London streets are being peppered with books this summer – or rather, benches designed in homage of some of the world’s best-loved literature. 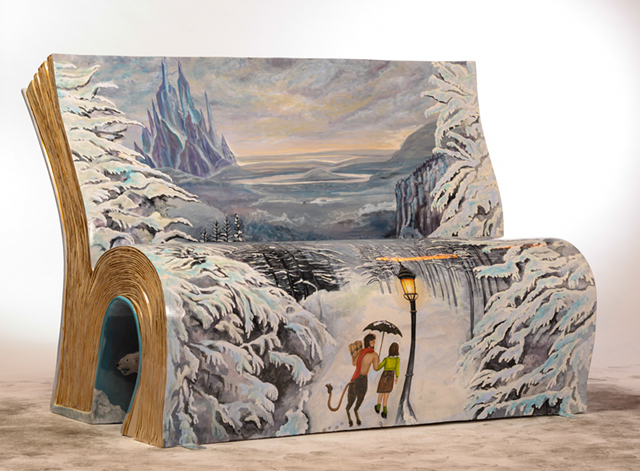 From Terry Pratchett’s Discworld novels to Lewis Carol’s The Lion The Witch and The Wardrobe, the National Literacy Trust’s Books About Town campaign celebrates reading in the most vivid of ways – with seats resembling open books. 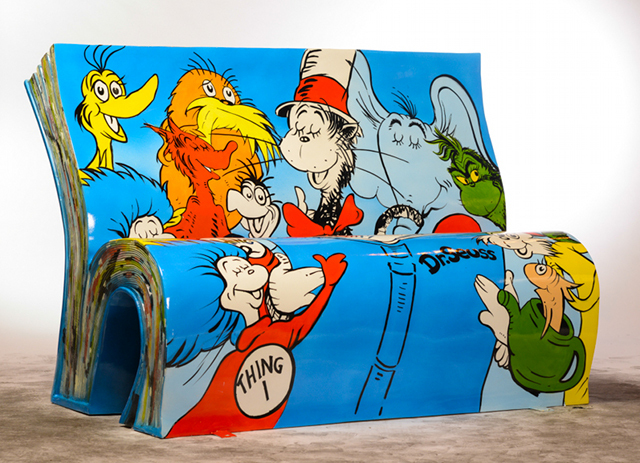 Many, such as the Dr Seuss bench, with the author’s deliciously weird characters recreated by Jane Headford, are instantly recognisable. Others, including the ‘Always try to be a little kinder than is necessary’ bench inspired by J.M. Barrie’s novel The Little White Bird, are likely to have people guessing, but still stand out as glorious works of art that will have visitors to London’s streets pondering literature in new ways. 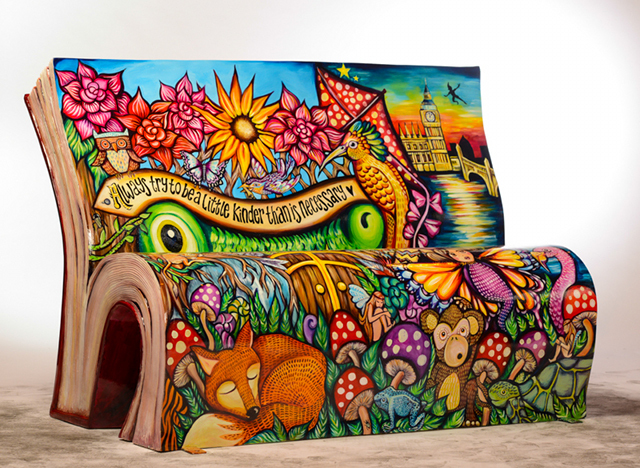 There are 50 unique BookBench sculptures in all, created in collaboration in with Wild in Art, and devised mainly by local artists. I’d love to see the venture spread across the UK, awarding every city, town and village with a bench revealing a local literary connection. Best of all, the benches are actually there to be sat on, so you can take a load off, pull a favourite book from your bag and enjoy a few moments’ escapism. And before you walk a way, take a look at the back of your bench, which in most cases will be as gorgeous as the front. To find the full list of books featured, pay a visit to www.booksabouttown.org.uk where you’ll be able to download maps of the four BookBench trails. 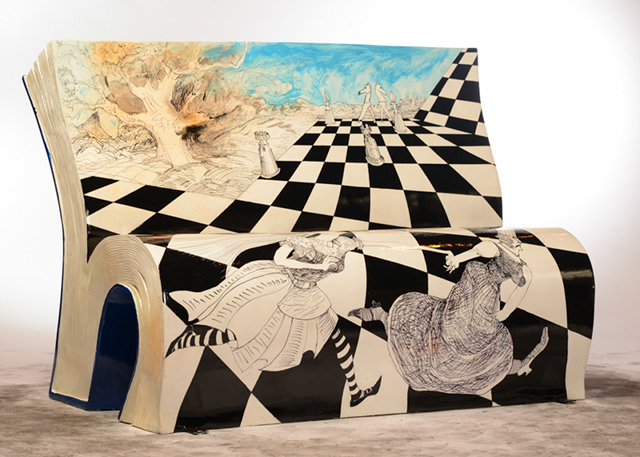 The BookBenches will remain scattered across London until 15 September, before being auctioned off at the Southbank Centre on 7 October 2014, so you’ll have the chance to bid on your favourites. All funds raised will go towards enabling the National Literacy Trust to tackle illiteracy in deprived communities across the UK. Happily, new research from the charity reveals that 53.3% of 8 to 16 year olds now say they enjoy reading, compared to 51.4% in 2005. So it’s definitely going in the right direction. 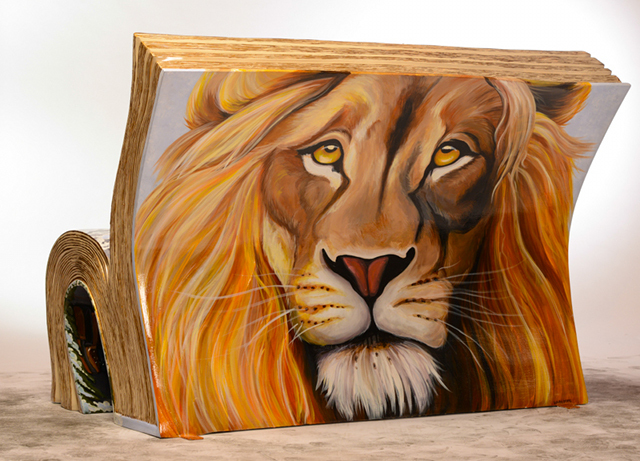 Here’s hoping a summer of spotting beautiful book-inspired benches will boost this literary love even higher! I enjoy a piece of artwork with subtle depths. Throw in some storytelling elements, and I’m yours. A new exhibition by Italian artist Riccardo Girardi, called ‘Hidden Words On Canvas’, initially caught my eye for this reason, but the fact his preferred medium is ballpoint pen made me look at the humble writing implement with a fresh eye. His unconventional approach follows an unconventional artistic journey from art school pupil to teacher to musician, before joining the fire service then working on cruise ships, eventually rediscovering his passion for drawing in London. I’m glad he did! There’s a sense of background movement to much of his work, and an impression of Riccardo’s subjects pausing to contemplate some deep troubling thought that halts them in a time of haste. Riccardo Giradi’s exhibition ‘Hidden Words On Canvas’ will be on show at Le Dame Art Gallery, 28 Powis Terrace, London W11 1JH, until 19th July 2014. A really simple one this week, with lots of potential for utter mayhem! 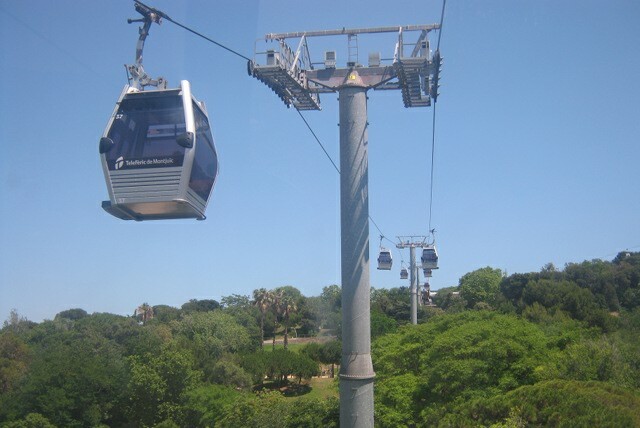 Pop your character in a cable car hanging over somewhere meaningful to them. As their car approaches another, they see something or someone unexpected in the one passing theirs. I love the idea that the sighting would be so fleeting, and that they’d be trapped in a bubble travelling in the opposite direction to whatever or whoever they’ve just glimpsed – how frustrating! Each of us has secrets, regrets and self-doubts that must be faced up to if we’re to do our lives justice – and this is the foundation on which Jemma Wayne has built her absorbing debut novel, After Before. Lynn, Vera and Emily are three women with little in common, aside from the fact each has a secret, or several, that they’re trying their darnedest not to think about. Lynn’s biggest and most urgent one is revealed early on – she’s dying, a detail that dredges up a mass of long-buried sorrows that she does her best to convert into irritation with the world in general and Vera in particular. Vera, the fiancée of Lynn’s son Luke, is youthful, vibrant and, in Lynn’s eyes at least, carefree in a way that gets right under Lynn’s skin. Yet she too is haunted by past decisions, just as sharply as, if less compellingly than, Lynn and Emily. Remember the Fun Runs you used to endure at school, how competitive and boring and un-fun they were? Finally our childhood disappointment has been faced head-on with a vibrant 5K called The Color Run. Yes, the spelling looks a little odd to us Englanders, but The Color Run started in the US in March 2011 and now takes place in an astounding 170 cities in more than 30 cities across the world. It’s a simple premise – start wearing white, run 5 kilometres, and reach the finish line daubed vivid rainbow shades thanks to regular drenchings of coloured powder. Back in the UK for a second year, it’s already brightened up London and Manchester, and is heading to Sunderland, Birmingham, Belfast and Brighton and Belfast. Not only will it be the jolliest run of your life (just a guess), but it all culminates in massive party, plus you’ll have the opportunity to raise funds for Save The Children. What’s not to like? Remember how much fun you had in trees as a child? This summer, rediscover those leafy delights with a tree-climbing adventure on the Isle of Wight. Run by Goodleaf, these tree climbs are less about raucous jollity than a chance to relish some contemplation close to the sky, secure in the embrace of an ancient oak. A magical way to experience an English summer! The climbs take place at dusk to allow you to enjoy the gradual shift from day to evening, with views over the Solent as well as the clouds and birds. Experienced climbers will teach you the ropes, equip you with helmets and then wave you off on your journey to the tree canopy. Taking part costs £38 per person or £70 for two, and includes tree climbing equipment, instruction and insurance, plus refreshments including tea, coffee, Elderflower cordial and special Tree Climber’s Flapjacks. 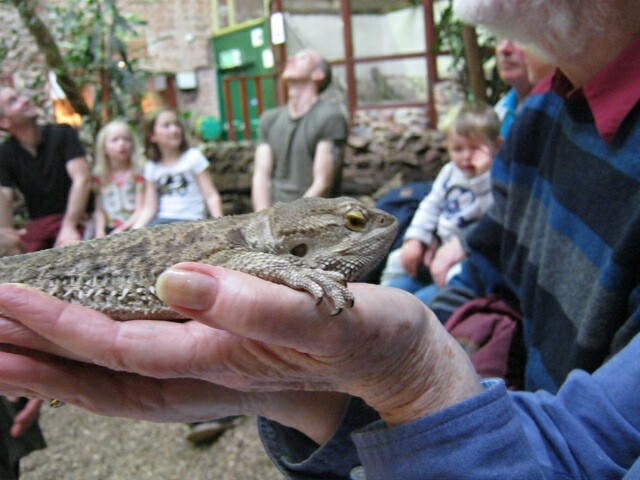 Call 0333 800 1188 or send an email to info(at)goodleaf.co.uk to book. Find out more at www.goodleaf.co.uk/2014/twilight-tree-time. This coming Monday I’m taking part in Small Stories, the monthly literary event hosted by Natalie Burns and Sian Wadsworth, at Small Bar on King Street in Bristol. At least I had an umbrella with me that day, which was unusually efficient of me. But you didn’t yet know that of me, any more than I could guess that you organised your sock drawer by hue, transforming the balled-up grey and blue woollens into something resembling a close up of an Impressionist painting. The second, well, you’ll just have to wait and see! Small Stories at the Small Bar takes place on Monday 7th July from 7.30-9.30pm, and is free to attend. Hope to see you there! The Write Life magazine, which is on the App Store for iPads and iPhones. Laura’s idea utilises Futureme.org, a great service that allows you to write an email to yourself and have it delivered to your inbox at some point in the next 50 years. I’d just like to add the suggestion of doing this for one of your characters instead of yourself, and imagining the response of their future self to receiving the email at some random time in the future. What a great chance to write about something you’re going through right now, a challenge, a blessing; a hard job or a young love, and think about what your future self would think about it. Another way of thinking about it is, what will your future self want to say to the younger you? 1. Decide what event to write about, and which “future you” you want to send the email to. Do you want to read it six months from now, a year, five years, ten? You can choose to have the email delivered anytime in the next 50 years. 3. Spend 10-15 minutes writing the letter. What do you want to say about what is happening right now, and perhaps where you hope to be when you read the email? 4. Be sure to choose an email address that you’re likely still to use in the future. Also check that futureme.org is whitelisted by your email provider so that it doesn’t land in your spam folder. 5. Choose whether to make the letter private or ‘public, but anonymous’. The ‘public, but anonymous’ letters that have been delivered recently are published on this page, http://www.futureme.org/letters/recently_delivered?offset=0, and make for great reading. Got an idea for a writing prompt you’d like to share? Send it to me at Judy(at)socket creative.com! And if you write something prompted by this, please let me know. With your permission, I’d love to publish it on SkyLightRain.com.